The number of non-religious people in Britain has increased on average by a million each year in the last seven years, according to the Annual Population Survey from the Office for National Statistics (ONS) released April 2019. Eight religion and belief groups dominate Britain (Figure 1). 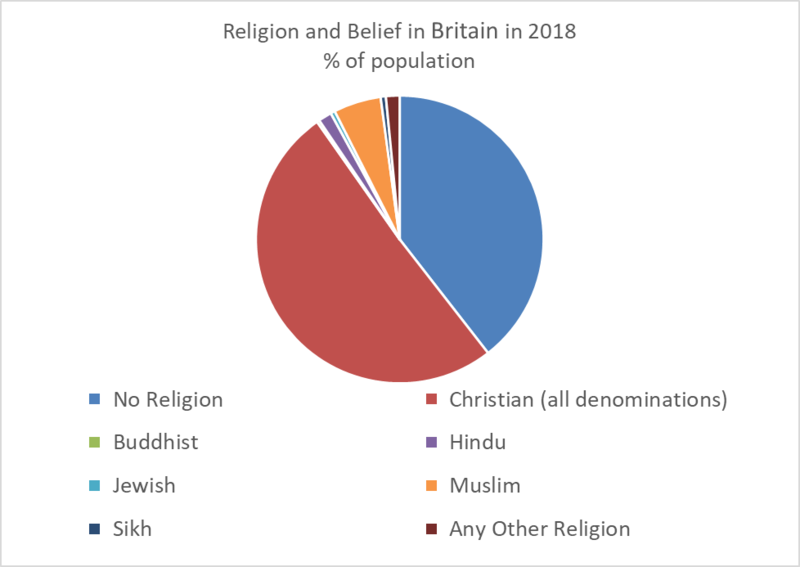 In 2018, the 63.4 million British population was made up of 32.2 million Christians (all denominations), 25.0 million non-religious, 3.4 million Muslims, 1.0 million Hindus, 0.4 million Sikhs, 0.3 million Jewish, 0.2 million Buddhists and 1.0 million from other religions. Figure 1. Source: Office for National Statistics (April 2019). The non-religious have grown by almost a half in the last seven years. Now four in ten people are non-religious (Figure 2). In 2011 there were 17.1 million non-religious people in Britain or 28.5% of the population. By 2018 non-religious people had gone up by 7.9 million. This is a 46.0% increase at an average increase of 5.6% (about a million) per annum. In 2018 there were 25.0 million non-religious people or 39.5% of the British population. Figure 2. Source: Office for National Statistics (April 2019). 1 in 8 or 5.7 million has left the Christian religion in the last seven years (Figure 3). In 2011 there were 37.9 million Christians (all denominations) in Britain or 63.0% of the population. By 2018 Christians (all denominations) numbers had gone down by 5.7 million. This is a 15.1% decrease at an average decrease of 2.3% (about 700,000) per annum. 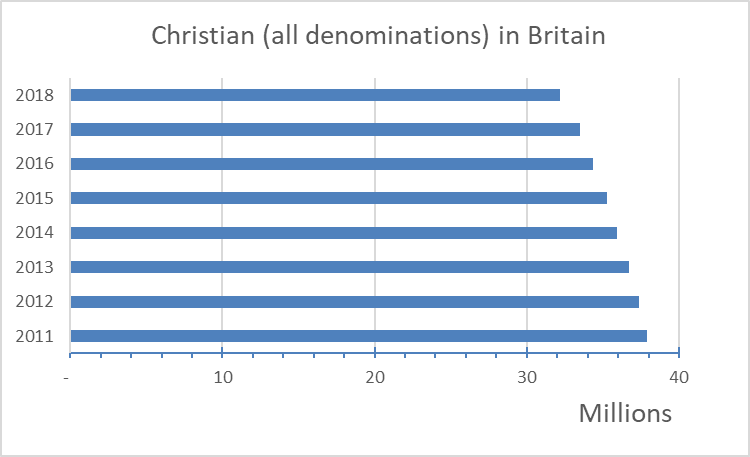 In 2018 there were 32.2 million Christians (all denominations) or 50.8% of the British population. Figure 3. Source: Office for National Statistics (April 2019). The Muslim population has grown by 616,000 to 3.4 million in the last seven years (Figure 4 & 6). 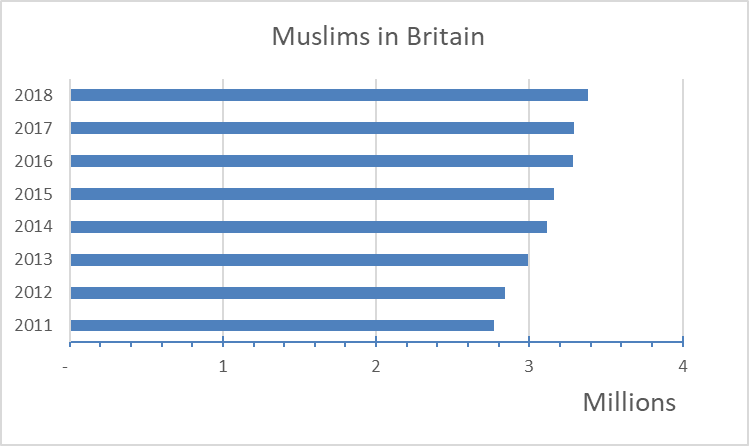 In 2011 there were 2.8 million Muslims in Britain or 4.6% of the population. By 2018 Muslim numbers had gone up by 0.6 million. This is a 22.2% increase at an average increase of 2.9% (about 75,000) per annum. In 2018 there were 3.4 million Muslims or 5.3% of the British population. Figure 4. Source: Office for National Statistics (April 2019). The ‘any other religion’ group has grown by 295,000 in the last seven years (Figure 5 & 6). 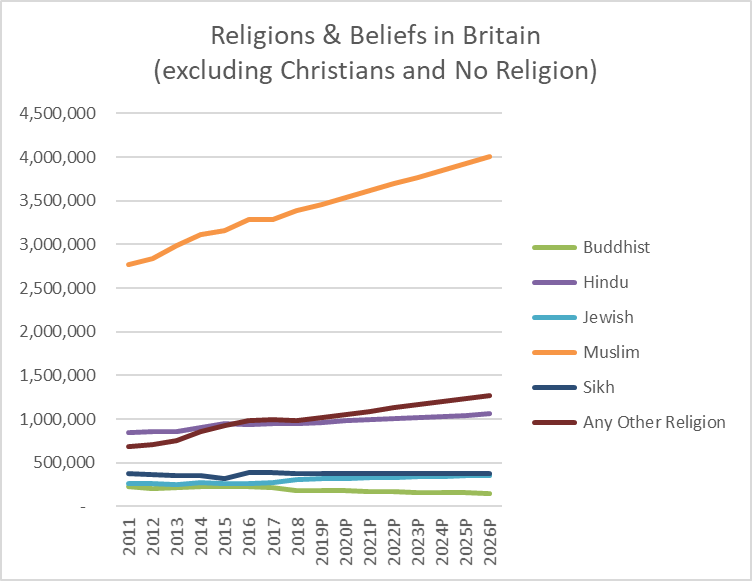 In 2011 there were 0.7 million in the ‘any other religions’ group in Britain or 1.1% of the population. 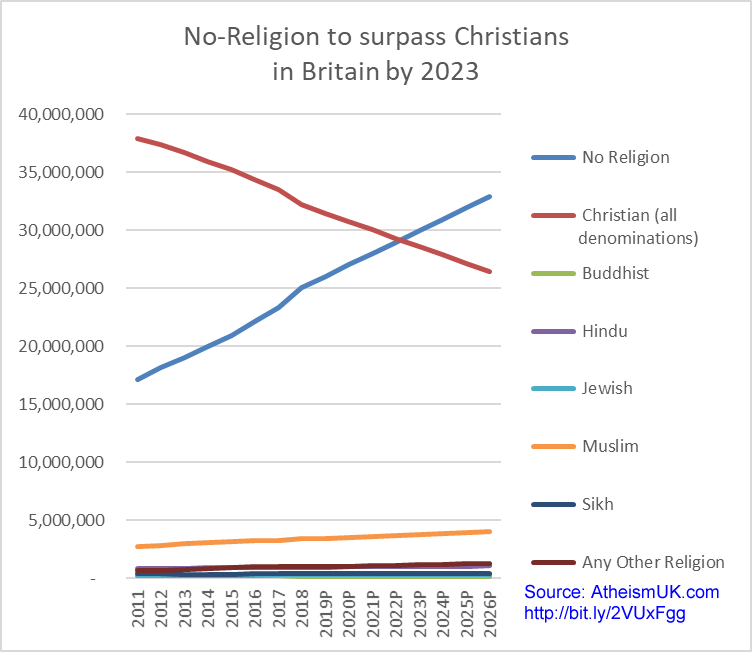 By 2018 the ‘any other religions’ group had grown by 0.3 million. This is a 43.1% increase at an average increase of 5.4% (about 40,000) per annum. 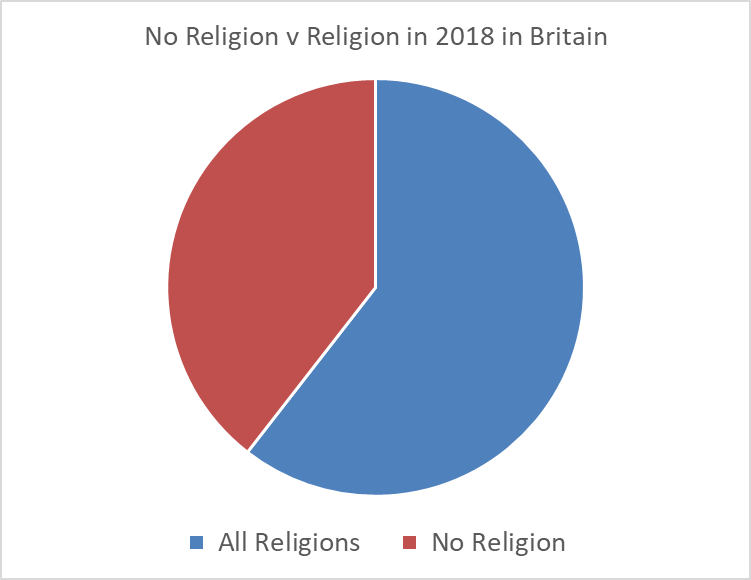 In 2018 there were 1.0 million in the ‘any other religions’ group or 1.6% of the British population. Sikhs fell by 0.1% and Buddhists fell by 16.7%. The non-religious grew by 46.0%, Muslims grew by 22.2%, Jewish grew by 16.8% and Hindus grew by 12.5%. Figure 6. Buddhist, Hindu, Jewish, Muslim, Sikh and Any Other Religion in 2011-2018 (Actual), Projected 2019P-2026P. Source: Actual figures – Office for National Statistics (April 2019). Atheism UK calls on the Government to take notice of the ONS figures by better representing non-religious people in fairer government policies that represent everyone, regardless of religion or belief. Atheism UK was founded over a decade ago in March 2009. We challenge religious faith and privilege.